When we talk about tomato sauce, most of us will envision a plastic bottle containing red stuff. The sauce I'm talking about here is a different thing altogether. It's easy to prepare, lends itself to variations, keeps well in the fridge and even better in the freezer - just about indispensable for every "cook on the run". 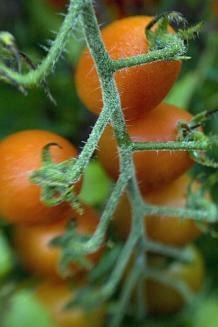 In summer, when the garden is abundant with fresh, ripe, sweet tomatoes, I take these. But the rest of the year I take a tin because tomatoes in June taste like wet dishcloth. I enjoy making this sauce, that's why I usually don't cook lots of it, just enough for two or three pottles. But feel free to roll up your sleeves and fill a bathtub. In a saucepan heat oil until moderately hot, turn heat to low and add onions and anchovies, if using. Cook for 3 or 4 minutes or until onions are soft, but not brown and anchovies have disintegrated. Add carrots, oregano, salt, sugar and garlic, if using. Cook for another couple of minutes before adding the tomatoes and tomato paste. Add pepper to taste. On very low heat simmer for 30 minutes, stirring twice. After 30 minutes the sauce should be thick, almost like tomato paste. Cool and fill into plastic pottles. If you feel funny about it, go fishing in the sauce for the tomato skins. I never bother because the skin adds texture to the sauce. Put the pottles into the freezer when completely cold. One of the recipes should boil down to fill a 250g cream cheese container. Usually I like the sauce to have bits and pieces to bite on, but sometimes it needs to be smooth, so either strain through a sieve or mouli or puree in a blender. Back to the pizza base. One day, I keep saying to myself, I will have convinced everybody that it is dead easy to rather quickly make your own. But until then you might have to buy it. There are ones in the cold store of the supermarkets that aren't too bad. It is fun to allow everybody their own favourite toppings. So on pizza days I start like this: In the morning I take a sauce pottle out of the freezer. One is enough for four pizzas. Half an hour before tea I make pizza dough or unroll the bought bases, put them on lightly oiled pizza trays, spread 1/4 of the sauce onto each base and preheat the oven to "full blast". Then I chop some mushrooms, maybe some bell peppers, open a tin of tuna, grate some cheese, and put everything into individual bowls. Of course you can use lots of other things on your pizza, such as salami slices, anchovies, olives...whatever you like. Have everyone place their favourite toppings on the pizza, cover with cheese, sprinkle with some dried oregano and bake for 7-10 minutes or until golden. Ok, boil water, add salt, cook spaghetti until just right, drain, leaving a little bit of cooking water in the pot to keep the pasta moist. Divide into bowls, add two or three tablespoons of the sauce and enjoy. To vary the sauce for pasta, add thyme, parsley or basil instead of oregano. If you take fresh basil, roughly tear it into bits, don't chop it. Add it just before using the sauce, don't cook it, otherwise it will go black and lose its flavour. Add two anchovies, chopped black olives or capers. You can slice two or three mushrooms and fry them with the onions to add an earthy flavour. For a meat variety, brown 100 g of beef or lamb mince and add to the sauce. Fish is lovely, too. Add half a cup of water to the sauce and then add a fillet of fresh or smoked hoki or whatever other fish you fancy at the end of the cooking time while the sauce is still hot. Cook for 1 or 2 minutes only. With two forks divide the fillet into flakes.